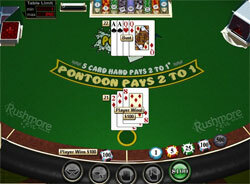 As well as any blackjack variation, Pontoon is the game of skills and it is based on mathematical schemes; so, it is clear that Pontoon is possible to beat if you know its basic strategy. As well as conventional blackjack, Pontoon has its basic strategy charts for different types of hands (soft, hard and splitting pairs) which were developed by blackjack professionals for you to play and win Pontoon quicker and easier. Hit. If a dealer has 6 - you can double. Double if a dealer has 2-8; hit if a dealer has 9, 10, Ace. Hit unless a dealer has 6. Hit unless a dealer has 4 - 6. Hit unless a dealer has 2 - 6. Stand unless a dealer has 8-10. If a dealer shows an Ace - hit. Stand unless a dealer has 2-7: hit if you have 4 or more cards at the moment. Stand unless a dealer has 10 or an Ace: hit if you have 5 or more cards at the moment. If a dealer has 9,10, Ace - hit; otherwise - pair. If a dealer has 2-8 - double; 4-6 - split. If a dealer has 2, 3, 7-Ace - hit; 4-6 - split. If a dealer has 2-6 - split; 7 - hit; 8-Ace - hit. Split. If a dealer has Ace - stand. Split. If a dealer has 2, 7, 10, Ace - stand. Split. If a dealer has an Ace - stand.